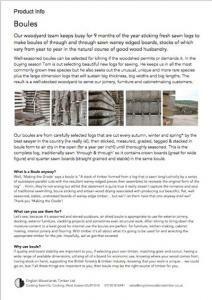 Our English logs are sawn through & through, sticked and stacked, in boule form, in our yard for air drying (for a year per inch!) every autumn, winter and spring until dry enough to be kilned. Until that time they are available for exterior joinery, furniture making, cladding projects and structural work. We keep boules stock in as many species as we can and as many thicknesses as we can but we can also cut and source to order for specific requirements.